Since its founding in 1930, TKF has developed from a cable manufacturer to a technologically leading supplier of connectivity solutions. With a broad portfolio of cables, systems and services, we offer customers worldwide solutions for creating safe and reliable energy and data connections. Through a focused commitment in the Building, Industrial and Telecom market segments we distinguish ourselves through our specialized knowledge of applications and solutions with a high degree of reliability, quality and service. At TKF we wish to support our clients where possible, designing and producing cables specially made for the marine environment creating added value and a high return on investment. TKF offers more than 350 standard types of cables worldwide available from stock, such as installation, signal and communication cables, with short delivery times thanks to high local stock levels. Additionally, TKF offers tailor-made solutions achieved in cooperation with the customer. In addition to our complete portfolio, our (logistic) service concepts meet the special challenges of marine markets. When necessary, TKF develops new technologies and service concepts to simplify complex situations, with attention to cost reduction, installation efficiency, safety and the environment. 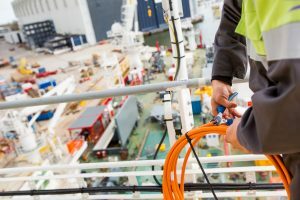 Examples include cut and labelling of shipboard cables and “just-in-time” delivery, all in close cooperation with the customer. Our product specifications closely match customer requirements even when they are highly specific and meet the international standards. With more than 45 years of experience in shipbuilding, TKF has a wide range of certificates.